Painting from a sketch or photograph. What's best? 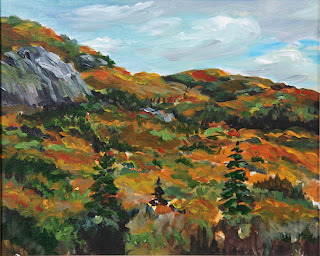 I do a lot of plein air painting. I like to get outdoors and seeing the light, space, environment and colour in its natural state is invaluable for the landscape painter. But the great outdoors or a paint box may not always be at hand and like other artists I take photos of scenes that I like. Some are for reference, others are ready-made compositions just waiting for a brush. 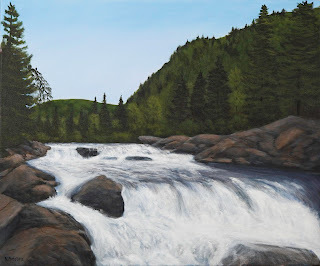 With the long, cold Canadian winter it's not always possible to get outside and when you paint in acrylics with water cold weather can be problematic! Here I'd like to show you how I take a sketch and a photograph to a larger painting. With plein air sketching I try to capture the mood, light and atmosphere with specific colour notes that try to represent my emotional reaction to the place. I have ready access to great wilderness areas where I live in Northern Ontario, Canada, many within an hours' drive from home. 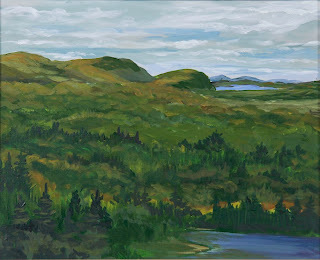 This plein air painting was done just 20 minutes from my home and it shows the vast expanse of the Algoma forests. It was a cloudy, early fall day. Working fast I put the main subject, the distance hills, down fast followed by the sky so I could capture the moving clouds. I use small, in this case 10"x12", masonite panels double coated with a slight grey tinted gesso and a limited palette. Early fall presents a strong light with the trees beginning to show their riot of colour. It took 2 hours to do. It went by very fast. I use a loaded brush and am generous with paint. 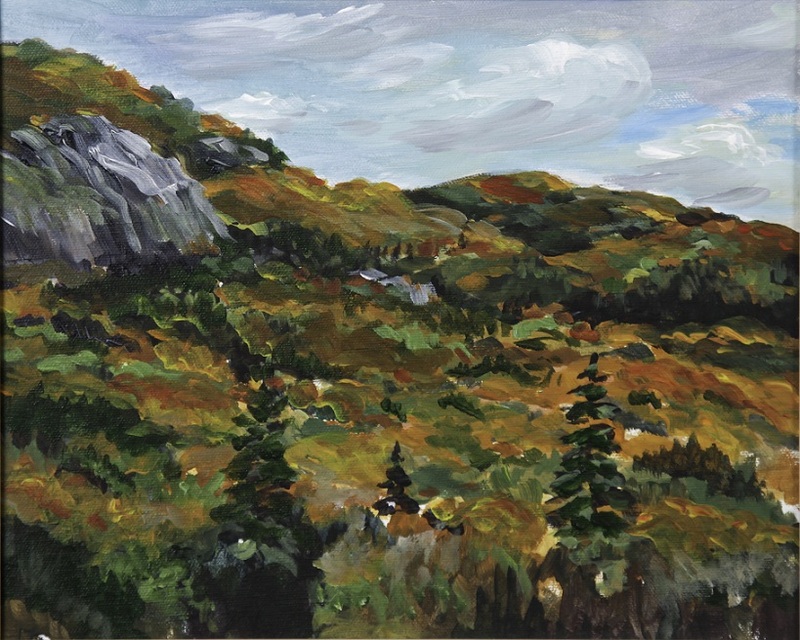 Back in the studio I wanted to get more fall colour into the scene so I took some liberties while trying to stay true to the first impression I had of the sky and distant hills. This presented a bit of a challenge but when you've lived through many seasonal changes the fall becomes second nature and is ingrained into your memory. I wanted to give the studio painting more distance so I emphasised the foreground and pushed back the distant hills by flattening the treed hills, making them more of a mass of trees. 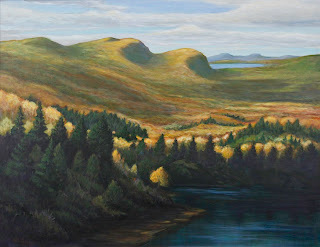 This beach is just around the bend in the top left from my cottage studio on Lake Superior. It was a windy day but the lake can be very wild in bad weather and this early summer's day was cold as the lake rarely warms up since it is so big and deep. It's quite shallow at the beach and my dogs were having a great time in the water but when the sun started to set the play of light on the sand and water caught my eye. This is one of those time that a camera is invaluable since this scene was gone in minutes. 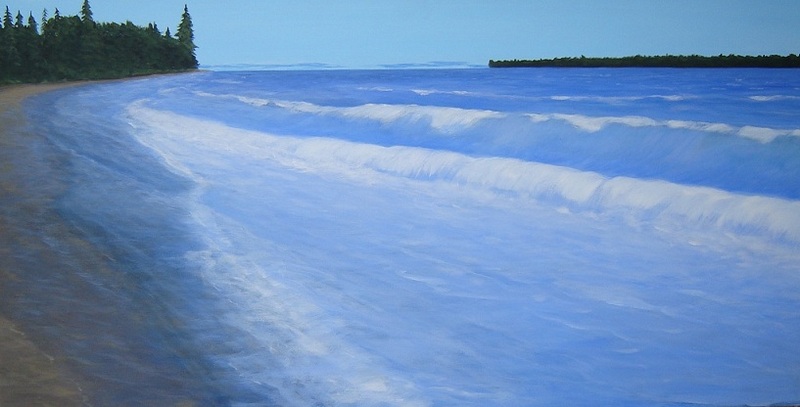 With the memory of this fresh in my mind I wanted to express the cold lake and crashing waves as I remembered them, along with the wet sand and smell of the fresh air. 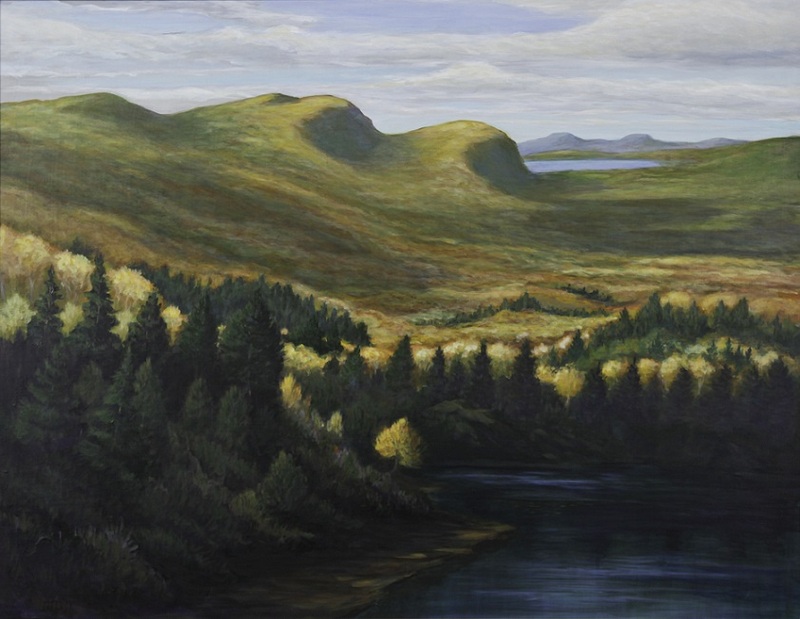 I chose a large canvas, 24"x48", and got to work blocking in the sky, island, tress and water. My main goal was to create the emotion of cold water and wind so that the viewer could transport themselves to the beach. 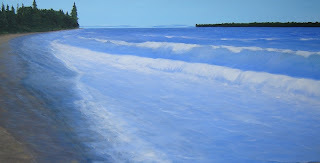 Here I worked with many washes of colour, building up the waves and back wash on the shore to give the water on the beach a very transparent look and feel. Every time I see this I remember that day. You can see more like this on my web site.